The primary goal of the Private Lands Program (PLP) is to provide private landowners with the resources to create and manage habitat to benefit a variety of wildlife. The PLP provides technical and financial assistance to eligible landowners for habitat improvements that address wildlife needs. To learn more about the types of assistance available, eligible projects and how to obtain assistance, select your region below. In the Southwest region, the Private Lands Program focuses on providing technical and limited financial assistance to landowners interested in the management and restoration of wildlife habitat. Currently, financial assistance is available only for projects involving grasslands, oak savanna and oak barrens. Additional technical assistance may be available for landowners interested in improving habitat for deer and/or turkeys. Sites larger than 20 acres. Smaller sites that are part of, or adjacent to, sites of high ecological value (i.e. fens, savanna, threatened and endangered occupied). Grasslands that are adjacent to, or in close proximity of hay-lands, CRP fields, and other grassed cover type. Restoring native prairie by planting various native seed mixes to address site conditions and landowner goals. Management of established grasslands by recommending appropriate practices such as prescribed fire, disking or inter-seeding. All phases of restoration or management of oak savanna or oak barrens sites. Invasive species control in and immediately around established or new grassland, savanna or barrens sites. Sites enrolled in CRP or other Federal Farm Bill programs. For landowners interested in improving your land for wildlife, and who meet the above criteria, please contact the Private Lands Biologist for your region. Our biologists can discuss your property and wildlife goals to determine what type of assistance and potential funding sources are available to help you enhance your land for wildlife. In the Southeast region, the primary focus of the Private Lands Program is providing technical and financial assistance to landowners interested in establishing and managing grasslands for pheasants and other grassland wildlife. 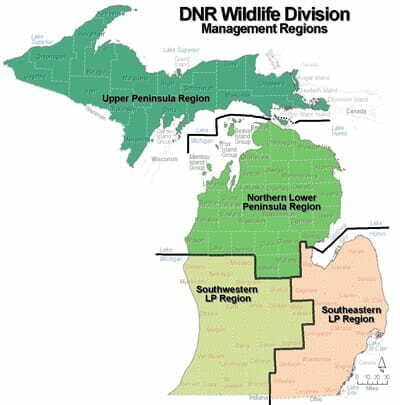 Additional technical assistance may be available for landowners interested in improving habitat for deer, wild turkey, waterfowl and other wildlife. Priority is given to landowners interested in enhancing 25 or more acres. The Landowner Incentive Program in the northern Lower Peninsula concentrates on creating or maintaining jack pine barrens habitat and jack pine forest ecosystems. Prescribed burns and/or native grass plantings to restore barrens or grasslands. Jack pine planting to improve habitat for endangered species. Northern Lower Peninsula LIP biologists can provide advice on most projects that are at least 20 acres. Preference will be given to properties that fall within priority areas (see list below). Projects outside the priority areas that provide a direct benefit to a LIP target species within the focus habitats or are greater than 40 acres may be eligible for assistance. Contact Brian Piccolo, LIP Biologist, at 989-275-5151 ext. 2030 or via e-mail at piccolob@michigan.gov.